What if there is extraterrestrial intelligence? Turns out there’s a bunch of geniuses at the SETI Institute asking the same question. The SETI Institute is made up of real scientists doing real science. Using GIGANTIC RADIO TELESCOPE ARRAYS the way we use car keys. 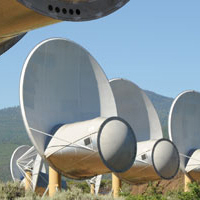 As funding for the SETI Institute is primarily donations from individuals and grants from private foundations, they have gotten very good at marketing and promotion. One of their best outreach efforts is their weekly radio show, Big Picture Science. Really, it’s even better than that. Hosts Dr. Seth Shostak and Molly Bently have been making Great Radio for ten years. They sound the way dance partners look, flowing smoothly, effortless, vigorously across synthetic biology and quantum computing. Having fun all the while. HERE’S THE REALLY GOOD NEWS — Big Picture Science is coming to Radio Newark! Barbara Vance and Jazz Beitler at creative PR made it possible for Big Picture Science to fit the bite-size radio format you love. (We call it “short attention span radio!” Ha!) They took on extra work in order to get one of the finest, most intelligent science radio shows delivered to your ears. Thank you Barbara, and thank you Jazz! Big Picture Science is a national hit. Now it’s up to you to make it an INTERNATIONAL hit!